Uganda’s police force have become increasingly reliant on tear gas in response to rising political disaffection in the capital. Police cruise through downtown Kampala. Credit: Adam Jones. This morning, after a weekend of quiet unease in Kampala, Uganda’s main opposition leader Kizza Besigye was bundled into a van and arrested for the fourth time in a week. He was detained as he left home hoping to lead a protest against what he has dismissed as “fraudulent” elections. The official results from the 18 February poll suggest that President Yoweri Museveni garnered over 60% of the vote. But amidst allegations of irregularities, delays, vote-buying and violence, Besigye and his Forum for Democratic Change (FDC) party have rejected the numbers and demanded an independent audit. Besigye has also called for people to take to the streets and had planned to lead a march to the electoral commission this morning. To what extent FDC supporters will heed his call to protest remains to be seen, as the Ugandan military continue to patrol the capital. Just days before the vote, David Senyonga and Edward Walusimbi stumbled back to Nakasero market in Kampala with reddened eyes and sweat streaming down their foreheads. 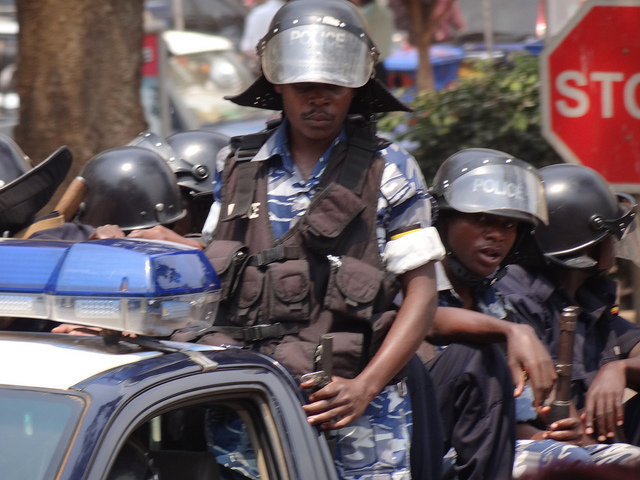 “So much tear gas!” they exclaimed as they recounted their escape from the crowds that had gathered to greet Besigye. Similar scenes were repeated on Election Day as the FDC headquarters were tear-gassed and raided by police, while protests elsewhere in country – such as in Kasese where a boy was reportedly shot dead by police – were also suppressed using the chemical agent. “Tear gas” is now an everyday term in Kampala, and its chemical formula a semi-permanent climatic feature in the capital. Residents exchange advice on prevailing winds prior to planning their journeys through town. Customers leave online reviews of local businesses that read: “safe place, [no] tear gas or rioting”. The women’s police rugby team in nearby Jinja are called the Teargas Rangers. And Uganda’s Finance Minister even cited the government’s decision to import rather than manufacture tear gas as a reason for the poor performance of the Ugandan shilling. If there’s one thing that connects opposition politicians to the population of downtown Kampala, it’s their experience of airborne chemicals. And Besigye is widely thought to be the most tear-gassed man in the capital. Countless of his demonstrations and marches have been ended by heavy deployments of state security services. In 2011, police officers fired a tear gas canister into his car during the Walk to Work protests against the rising costs of food and fuel. Tear gas comes in a variety of chemical formulas designed to irritate people’s mucous membranes, causing coughing, crying, sneezing, breathing difficulties and severe pain in the eyes. Its deployment dates back to the First World War, when xylyl bromide was used to force disoriented soldiers out of their trenches, exposing them to artillery fire. The proliferation of tear gas since then owes much to US General Amos Fries, who spearheaded the creation of an international gas market in the aftermath of the war. In 1921, the trade publication Gas Age Record proclaimed that the gas is “admirably suited to the purpose of isolating the individual from the mob spirit” and is equally effective at “dealing with mobs as well as with savages”. This versatility enamoured it to colonial administrations and, more recently, law enforcement agencies around the world. According to research by Anna Feigenbaum, there were 314 recorded cases of tear gas in 2013, the vast majority against nonviolent protesters. And in those ignominious global rankings, Uganda was sub-Saharan Africa’s most frequent user of tear gas and ranked a proud sixth worldwide. There are few signs of Uganda’s taste for tear gas slowing down. The US remains the largest exporter of tear gas today, but the Ugandan government began to import tear gas from China in 2011, in line with its shifting economic alliances. A large shipment containing “more than a dozen new tear-gas vehicles” arrived from China just last month, many of which have been put into action over the past week. In Kampala – the tear gas capital of sub-Saharan Africa – Edward, a vendor in Nakasero market, says he has been exposed to tear gas five times. David, a boda-boda (motorcycle taxi) driver, reports having experienced it on some thirty separate occasions. In fact, so prevalent is its use that Kampala’s markets have responded to the repeated gassing of the city centre by electing their own defence committees. These groups are responsible for anticipating the arrival of police, transporting afflicted persons to safe areas, and administering towels soaked in water and lemon juice. The political situation in Uganda today is finely balanced. Museveni has declared a resounding victory, which will allow him to extend his rule beyond his current 30 years in office. But many are adamant that the elections were not free and fair and are determined to challenge them in the courts and on the streets. And if this happens, there is little doubt that tear gas will drift in ever greater quantities through the markets and streets of Kampala. Will Monteith is a researcher and doctoral student in the School of International Development at the University of East Anglia (UEA). He has been working in Kampala’s markets since 2012. Hmmm, Much of the story is true especially at the rate of using tear gas. But then the author is not telling the truth as on Election day the opposition leader was not tear gassed and neither was their office that happened two days after. As a Ugandan longing for the change I am also cautious to tell the truth and raising things beyond what they are is really getting to be overdone with such incidents. I love my country please when sharing with the international community lets give the real picture. Please for the safe keeping of our country’s image. Hi Damon, never worry Almighty knows this is our present history which never existed before. And the external enemies of an internal peaceful coexistence of a particular nation whose lips are tireless of uttering words of interposition like William must know that several disastrous political crises had occurred in their incumbent proudly and peacefully claimed countries. Please! Enemies of Africa, whenever you intervene in our issues, you should reflect your own past; know that there is no country without history. I personally believe Wamara – this is a second phase of colonization following phase one of “Flag followed the Cross”. Africans must be vigilant! This all from the WEST! Be an angel of peace but not an angel of destruction.